Bryan Soh recaps one particularly brilliant day. After a whole five minutes of playing mind versus body and getting myself out of bed and to the bathroom to take a shower and brush my teeth, I went to get changed. The only difference? No shirts with TASIS badges on them. No ties, which I never fancied wearing. No burgundy or black-and-white TASIS sweaters. Not even dress-code shoes. I got my thermal wear, hoodie, and ski pants on and made a beeline downstairs for breakfast. We’re not in Montagnola. We’re in Crans-Montana. Welcome to Ski Adventure 2017, where running up the Lanterna stairs is replaced by shredding down fresh powder 2000 meters up in the Swiss Alps. Five days of sheer enjoyment and we are already on day four. Having had a hearty breakfast, my friends and I made our way to the Grand Signal to take the gondola up to the base station. It’s 9:00 AM and the base is already packed with skiers and snowboarders, eager to get on the fresh powder from the ongoing snowfall since last night. I meet with my snowboarding group and we make our way up to the top, Cry d’Er. Everyone was chattering endlessly about the fresh powder (we did not have much snow at all the first first days), and our instructor was clearly excited too. Bindings strapped on and it was time to shred. “Let’s ride,” the instructor exclaimed, which we responded to with loud cheers. And that was the beginning of one of the best days of snowboarding in my life. Welcome to Ski Adventure 2017, where running up the Lanterna stairs is replaced by shredding down fresh powder 2000 meters up in the Swiss Alps. Deep powder was everywhere and we finally got to venture off-piste, shredding untouched patches of fresh snow, pulling off little 180s and ollies from small bumps. I was ecstatic. If you have never ridden in fresh powder on a snowboard before, you’re missing out on a lot in life. It’s a sensation that cannot be compared to anything else—as close to heaven as it can get. After two hours of exploring virtually all the places we knew of, including untouched slopes that we’ve never seen before, we had our lunch break as our legs were burning after such a long period of endless riding. I met with my other friends, and we had a quick sack lunch before taking off for the slopes before our afternoon lessons. I honestly think that there is nothing more fun than snowboarding or skiing with your friends—no better way to bond with them and make so many memories. From the tiniest of stupid falls to the pure pleasure of cruising down big, wide slopes with a breathtaking view in front of you, some things are only experienced on the slopes and nowhere else, which makes it all the more memorable. Then the afternoon lessons came. In school, lessons are not my favorite part of the day. But for this week, they were. As our instructor brought us to the snow park and to other slopes as well, I never felt so much freedom and joy from simple airtime, tricks, and cruising down the mountains. Two hours cannot pass by more quicker than by simply going up and down the same snowpark repeatedly, doing the same tricks but getting better each time, and with it the satisfaction also becomes greater. Soon enough, lessons were over, and I heaved a huge sigh—not the type of sigh when you’re feeling burdened or relieved, but the type of sigh when you’re so tired yet so satisfied and happy just because you did so much in a day and the only emotion you felt was sheer joy for seven hours straight. I went for the last run of the day, back to the Grand Signal and then all the way back to La Moubra, our dormitory. And if you think that was where my day ended, it was not. After taking a short one-hour break, we had an ice-skating activity down in the town center. I have only skated once before in my life, and that experience made me love ice skating. (Where was that? At Outward Bound in 10th grade, which was yet another memorable TASIS experience.) An hour of ice-skating in a gorgeous setting of a cascading shower of snowflakes in the tranquil night was the perfect icing on the cake after a whole day of sheer adrenaline and unrestrained excitement. Following dinner and lots of chit-chat with friends as we shared our hilarious stories of the day, it was time to get some rest to recharge for the last day of snowboarding. 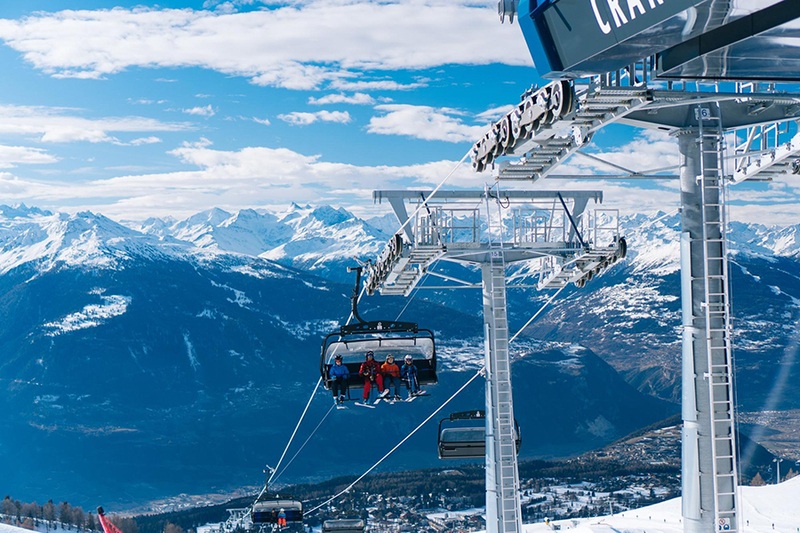 Aurelia Dochnal caught up with students throughout the week and asked them what they thought of this year’s trip to Crans-Montana. “I will never forget drinking hot chocolate on the top of the mountain with my best friends,” said Sasha Tsenter ’19 about her first TASIS Ski Adventure. What students on this year’s trip seem to remember most are the late-night heartfelt talks with roommates, exploring the Crans-Montana slopes, and ice skating under the stars. It’s true that the weather was sunny and pleasant for the first few days, but on Wednesday the fog and snow kicked in. “My instructor took us to a good restaurant when it got too foggy. That way, we didn't get injured,” said Zeydan Rahman ’19. Some students found their instruction groups “amazing” with “nice and funny instructors.” That part was up to chance as students were placed in groups according to their levels, but randomly. There is plenty of time in between lessons to have lunch and possibly ski or snowboard with some friends. “I'll never forget the fun I had with my friends snowboarding on the fresh powder,” reflected Filippo Cipolini ’19. “The tubing activity was really fun,” smiled Ottavio Kaye ’19. On Tuesday, as the weather conditions turned really bad, the students and teachers went snow tubing and sledging in the snow. There were intense snowball fights and lots of screaming, especially from the instructors! All in all, the week was an unforgettable adventure. It brought the entire group closer and gave us all shared experiences we won't ever forget. Ski Adventure is a truly essential part of the TASIS experience. Alex Secilmis '19 and Sasha Tsenter '19 helped Milo Zanecchia '08 create this amazing Ski Adventure video. In addition, a gallery of Milo’s excellent photos from the week can be found here.